I would like to try your app. My email is martin.bebow@gmail.com. Thanks. Hi - thanks so much for inquiring. The folks here helped with some great testing, but now the app is done and available in the Play store. It’s totally free to try, so please have a go and see if it meets your needs! @sctaylor Let’s touch base in the new year so we can help you with some promo on this. That would be an awesome way to kick off the new year! Will PM you in Jan. Thx! Thanks @sctaylor for stopping by the blog to tell everyone about ota2go! Does your app allow to change the download location to my microSD device? These days memory directly on my phone is very tight but the 400GB microSD I have installed is where I store data for memory intensive apps. Hi - yes, it sure should. I use my external card for this. The settings are simplified - if you go in to Settings and tap the location, it should let you pick internal or external storage. Note that you can’t set the specific directory - just the storage device. If you install the app and try before upgrading, you can be certain that it works on your particular device without any risk. Great to hear (whew… was worried because I was getting my hopes up). Looking forward to buying your app when I get my Quad (hopefully it is in the next 30 days). Awesome! Looking forward to having u on board Make sure you give it a good thorough test drive to make sure it works for you before upgrading. That said, I haven’t actually had to refund anybody yet because it didn’t work, but happy to do so if needed! Quick question: I have the Tablo Dual Lite with cloud storage (I do not have a physical storage drive connected), would this app still work, or would I need to invest in a hard drive? I would love the ability to download my recordings rather than stream them when I’m away from wifi. Hi – I believe so though I must say I’ve never personally tried it The very best thing to do is grab the app (totally free) from the Google Play store and try it out. It will let you download 20 minutes of any recordings – meant to be enough to validate that the app works well for you. If that works, and if you like the app, then you can do the in-app-upgrade purchase to enable full length downloads. If you’d be so kind, can you please let me know how your experience goes? Would be great for others to be able to find here too! I downloaded the app, but I have had no luck with downloading anything that is recorded on my Tablo. I went into settings and checked to notify upon failure, and to notify upon completion - but I have not gotten any notifications. I’m not sure if I’m doing something wrong, but I go to the episode I want to download and click the download button. I get the spinning circle indicating it’s busy, but it doesn’t ever download and I never get notified of a failure, and nothing ever appears in downloads. Hi – sorry to hear that, but thanks for letting me know! You should get a little message “analyzing xyz show”, the episode should turn pink, and you should see (after a few moments) some progress counting 0-100% - and all of this should be reflected in an Android notification (the little notify icons at the top left). I take it none of this is happening for you? 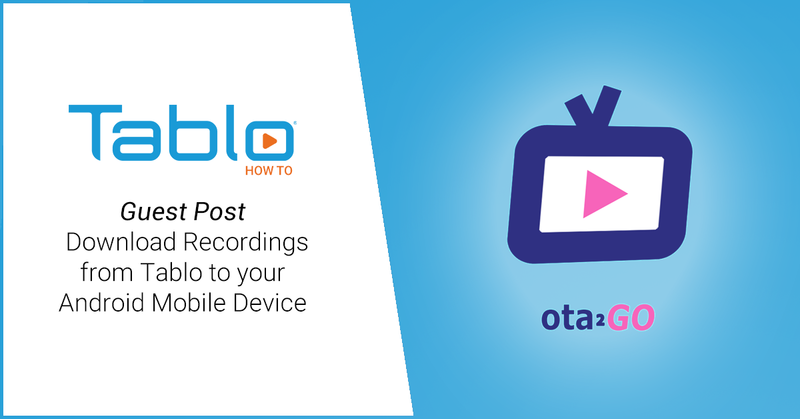 Q: If you hit the play button instead of the download button, can you watch your recordings through ota2go? So, when I hit play, it does play the episode. When I click download, it turns pink, I get a small toast message at rhe bottom and then the episode turns pink and I get a spinning circle, but no other notifications it just keeps spinning. I left it for an hour last night and nothing. I did record a video of what’s happening but I can’t upload it here to show you what’s going on. I’ll try to upload it to YouTube and link it when I’m off work. I’ll add that I’m doing this at home, using the same wifi the Tablo is on. When you first watched the video, it used an external player. Did you configure that in the ota2go settings? If so, did it work with the internal player before you set that up? I saw the toast message “test: downloading 3 mins” – did you ever see the “Analyzing Will and Grace” message in similar format? Actually, that recording I posted was the first time I ever tried to play the video. I just out of habit picked the video player I usually use. I should have opened up the settings on Ota in the video so you could see what things were set to. I’ll grab a screenshot in a bit and also try the default player. I’ll look it up in a bit and let you know. That is the only toast message I’ve seen. But I will keep an eye out in case I missed any others.